Add a bit of fun to your resources with this doodle font. This doodle font would be perfect for mystery icon sentences. Type out your sentence using this doodle font and have your students solve with clues and math equations. They will love being little detectives! This fun doodle font will definitely capture your students’ attention and make learning fun! 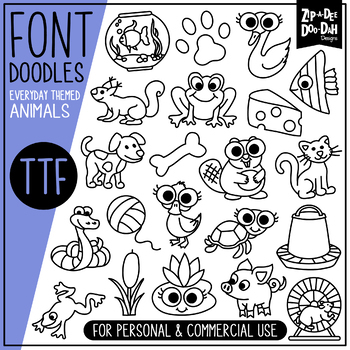 This doodle font was hand drawn by myself that is really a TRUE TYPE FONT (TTF) so you will be able to add them to your font suitcase and type with them. 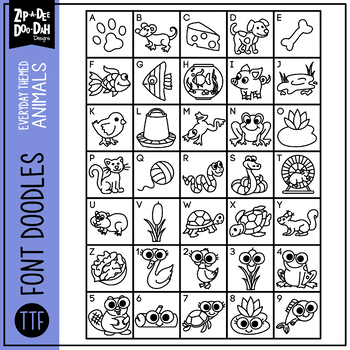 This font has 35 doodles which are assigned to capital letters A-Z and numbers 1-9. This font is headache free too! All my doodle fonts have been tested by multiple people in multiple programs to ensure there are no errors or problem installing. Be sure to check out all the preview pages for details. Font come in a standard font file format (.otf) and the color is solid black. All my fonts are for personal and commercial use. The price already includes the commercial license. PLEASE NOTE: This font is included in the Zippy Doodle Fonts Complete Bundle. Please don't purchase this set if you have already purchased the Mega Bundle Pack because you already own this set!